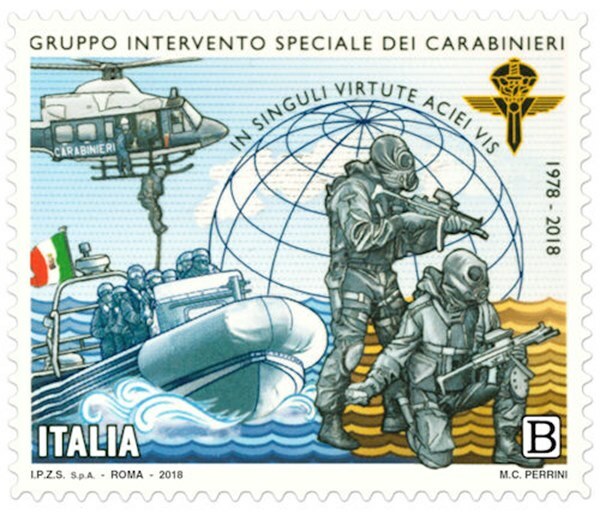 For the 40th Anniversary of the GIS-the Special Intervention Group of the Italian Carabinieri, Italy issued one stamp in 2018. The stamps is a tribute and a sign of gratitude towards a highly specialized military department that performs an extraordinarily precious job at the service of the community. It shows us three different actions of the Special Intervention Group of the Italian Carabinieri at land, sea, and air, respectively, in evidence on a stylized terrestrial globe with on top the slogan “IN SINGULI VIRTUTE ACEI VIS”. At the top on the right the emblem of the GIS. Source: Internet and Italian Post. Italy 2018 B sg?, scott?